The adidas adizero tempo 9 is a phenomenal shoe modeled after an original, proven racer from adidas yet with updates of the latest technology in sole cushion and stability. It's a beefed up racer or a minimal stability trainer, however you want to view and use it (or both!) for speed and distance running. This shoe is perfect for those who want to buy one shoe for training and racing or for those wanting a stable yet lighter shoe for speed workouts and racing. It will hold up for many miles but will not be an everyday shoe for those with high support needs. The Tempo 9 is updated with some changes from the last two versions of the shoe. The outsole pattern is still the Continental rubber plus adiwear combo for durability but was revamped in look. It appears like it functions similarly well; it’s best suited for road, and I had no problems running in wet conditions. The midsole however made a move toward minimal support by reducing the Stableframe in the forefoot down to EVA sidewalls with increased Boost filling in the gap, yet the brand counters this by extending the midfoot Torsion system back into a medial post in the heel. Regardless of the walled-up forefoot, the Boost layer between the sock liner and the outsole extends from heel to toe. 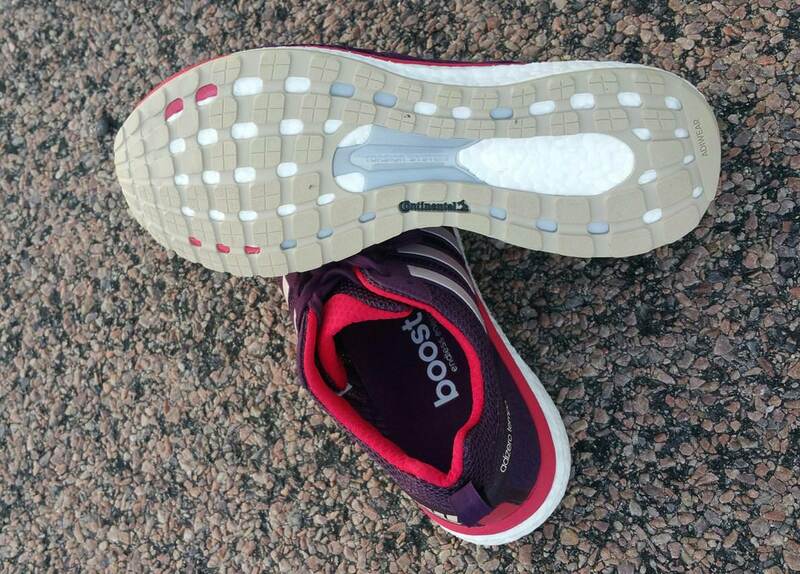 Under the forefoot, the sidewall is firm for guidance midstep, but the core is Boost foam. There’s a cut-out in the fabric lasting which gives foot direct access to the Boost midsole below. The upper also has a refurbished design with added strips of synthetic suede along the sides of the toebox, bringing a touch of support to the shoe that I appreciate. 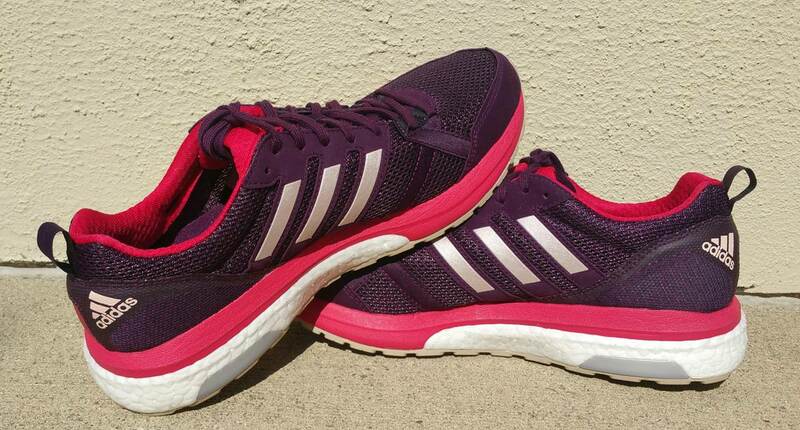 The adizero Tempo is a shoe that combines the seeming opposites of minimal design and cushioned stability. Compared with an adidas stability shoe that I really enjoyed, Supernova Sequence 9, Tempo 9 brings a surprisingly high degree of support in its upper—not quite as secure as Sequence with its overlays, but well done for its minimal style. Overall I enjoy the smaller toe box area in the Tempo contrasted with the other adidas models I’ve tried: Supernova Sequence 9, Vengeful, Supernova, Supernova ST.
It’s a true-to-size fit lengthwise, but if you prefer a more open area around the toes, you’ll probably want to go up a half size. The Tempo 9 continues to hold its own in the lightweight support category where it mingles with the ds trainer 22 and the brand new Dynamis from Asics, the 1500 V3 for New Balance, and Ravenna 8 from Brooks. These are lightweight models for fast training with enough cushioning for comfort over distance runs. They’re one level above the all-out racing flat category in terms of support and cushioning. My first introduction to adidas boost foam was in the brand’s Supernova Sequence 9 and Vengeful as I tested them at the same time: absolutely loved it. It provides superb cushion (feels soft) while somehow still remains responsive (bounces back and transmits the energy you provide into propulsion). Then I ran in Supernova (no “Sequence” added), which has MORE boost, and this took away from the responsiveness. Tempo 9 reminds me of the former. It does have a bit more boost and less Stableframe than Sequence 9, but the feel underfoot is similar. The Boost is bordered with sidewalls of solid EVA for support—cut back from the Stableframe of previous versions—but maintains boost up to the sockliner in the center forefoot. An outsole of Continental-adiwear rubber combo overlays the Boost for grip and resistance to wear, with spaces of exposed midsole under the forefoot plus a larger oval below the rearfoot, to save on weight. The old marathon racers were built with an upper of genuine suede over polyester mesh, and the adizero tempo 9 features synthetic suede in the logo overlay, around the toe, and in supportive strips to mimic the look. The support strips allow space for a “bunion window” making this narrow-fitting shoe work well for those with a bunion but an otherwise narrow foot, similar to ASICS’ GT-3000 5, while providing a counter to excessive inward roll of the foot. Around the heel the tempo 9 includes an internal heel counter to control horizontal heel motion. The minimal overlay and strips through the upper do provide a bit more support to the upper than is found in the similar adizero Adios 3 and adizero Sub2 shoes. 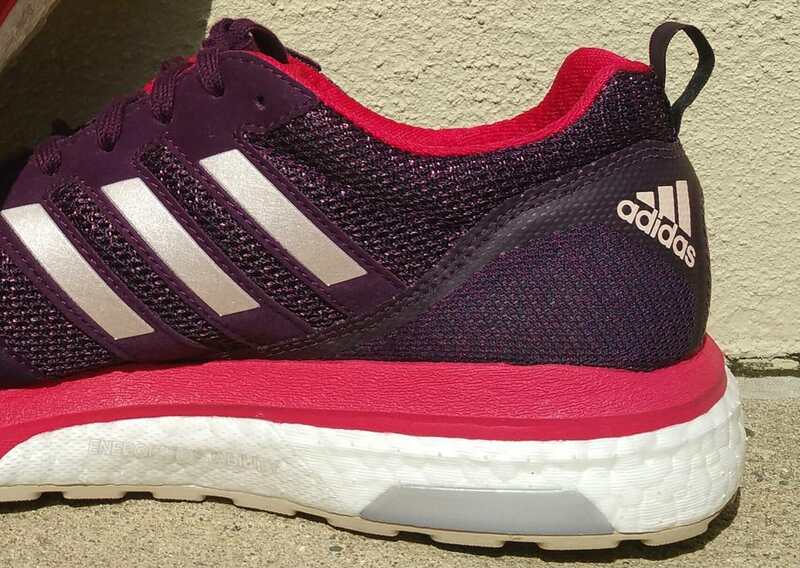 An aesthetically pleasing touch to the adizero Webbing that makes up the body of the shoe displays in the black strings weaved with the dark purple which then moves to the heel where the colorway contains flecks of the pinkish-red featured around the shoe’s ankle and in the midsole’s EVA (or charcoal in the gray models). I love the subtle touches! This designer deserves an award. The adidas adizero Tempo 9 packs a lot of quality into a minimal-style shoe with lightweight support in the upper and midsole as well as a sole unit that has the durability to handle many miles on the road in wet or dry conditions. Now with over 100 miles on the shoe, the boost under the forefoot is still holding its shape well. (If you want to check the wear level of your shoes, take out the sock liner and feel for a dip under the forefoot. Durable midsole materials will resist compression longer.) This ninth version is my favorite yet for the Tempo because of the added support strips along the toebox area. The minimal support of this shoe makes it a perfect option as a racing shoe for those who need a more supportive (ie: heavier) shoe for everyday training or as a stand-alone trainer/racer for those who want a lightweight shoe with a bit of support. Have you tried Tempo 9 or similar models? Let us know your experience in the comments! 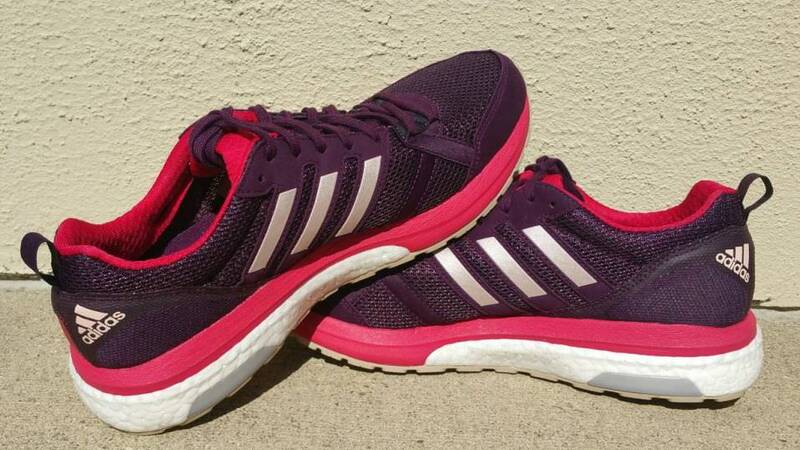 We purchased a pair of adidas adizero Tempo 9 from runningwarehouse using our own money. This did not influence the outcome of this review, written after running more than 50 miles in them. Spot on review of a great shoe. I’ve got close to 400 miles on my first pair and they are going strong. They have worked equally well for intervals, tempo and distance work, and in races from a 5K to a Marathon. Adidas really got it right with this one. I have run in DS Trainer 22s and Ravennas. Subjectively, the Tempo 9 feels lighter, firmer and provides a bit more support than the Ravenna. I really wanted to like the DS Trainer 22, and, indeed, set a marathon PR in a pair of them, but have found that the Tempo 9 works better for me, even if the DS Trainer feels like a slightly speedier shoe. Subjectively, the Tempo 9 feels a bit softer yet provides more support, and does so without, what is for my foot, an intrusive medial post. That said, they are all great shoes, so this is just personal taste. I am someone who definitely needs the support that the Tempo provides (I am not a good candidate for a Boston, for example), but through experience have found that my feet and I are happier running in light stability shoes than in shoes that provide more stability at the expense of weight or bulk. Maybe I am an exception to the rule that if a little stability is good, more stability is better, or maybe the real rule should be find what works. In either case, thank-you Adidas for the Tempo 9. The mystery to me is why I don’t see more people wearing Tempo 9s, DS Trainers or even Ravennas despite the fact that these models consistently get great reviews and are outstanding shoes. Why do you think that is? I absolutely agree Bruce. I have more than 500 miles on my first pair of Tempo 9s (still with no sign of significant wear) and a fair few more on a second pair. I think it is a great shoe for medium and long distances and I was very happy running a marathon in them recently. I enjoy running in the Adios 3 for shorter workouts, and have tried the Boston, but I keep coming back to the Tempo 9s which I find have a more satisfying feel than the Boston, especially at faster paces. I think the Tempo is underrated. Especially now the Supernova and Supernova ST are so bouncy and so, for me at least, not to my taste. Thank you for sharing your experience, Bruce! It seems we have a similar shoe preference for light stability. I love Ravenna 8, but the toe box has a touch more room than I prefer. Tempo has the toebox I like…if the heel would snug up like Ravenna, I’d have given it 5 instead of 4.5 stars. (I probably should have put this in the review!) Right now I’m pretty sure I’ll wear Tempo 9 for my marathon in January. As to why more don’t wear them…maybe its lack of marketing or that these shoes aren’t “extreme” in some way (cushion/midsole height, stability features, etc) to make them stand out, but I agree that this little “in between” category of shoe, rocks. I can see why some would want more arch height; I prefer this and have custom inserts that provide this (will probably leave them out for the marathon). 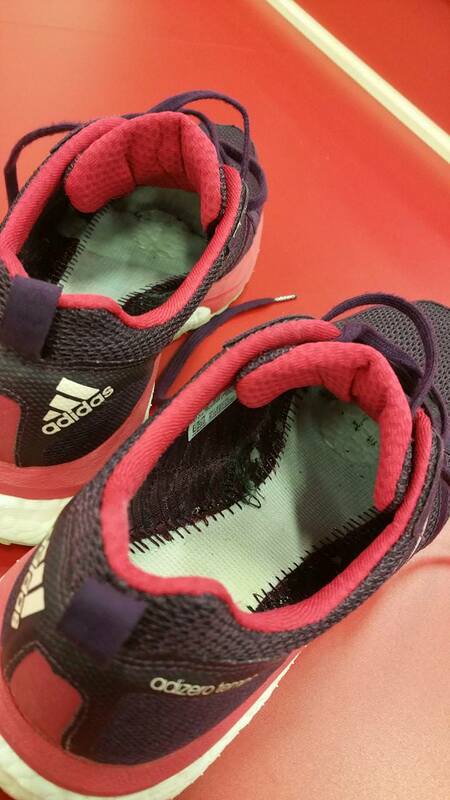 The overlays of some heavier support shoes also help to hold the foot more stable. Like you said, whatever works is the shoe people should stick with. I’ll probably do my long runs in ASICS GT-3000 5 (or whatever shoe I’m currently testing) for a bit more support, and I love Nike Odyssey 2 for internals. But for 1 shoe that does very well across all categories, I’d just buy the Tempo 9. What do you think about Ultraboost ST in relationship to Tempo 9? Could be a good complement for Long Runs? It looks like it would be great for extra cushion during long runs. More boost takes away from the responsiveness but offers great padding. Hernan, I have run a lot in Tempos and like them, but I did not get on well with the Ultra STs which I found to be too unstable for me. They are very different in any case so try before you buy! I wear these for my interval work on the road. They are perfect for my 5 minutes on 1 minute rest 2 or three times. I always look forward to wearing them. I have run in the Boston for distance but end up taping my foot because of blistering on the side of the ball on my foot. Any recommendations for the same type of construction of the Tempo 9’s for longer distances? I have tried using them for this but I end up feeling pretty beat up. I have trie the Supernovas and use them for walking. The best I have come up with is the Mizuna Waverider 21 after breaking them in (or down!) after 1 year. Thanks in advance for any advice! 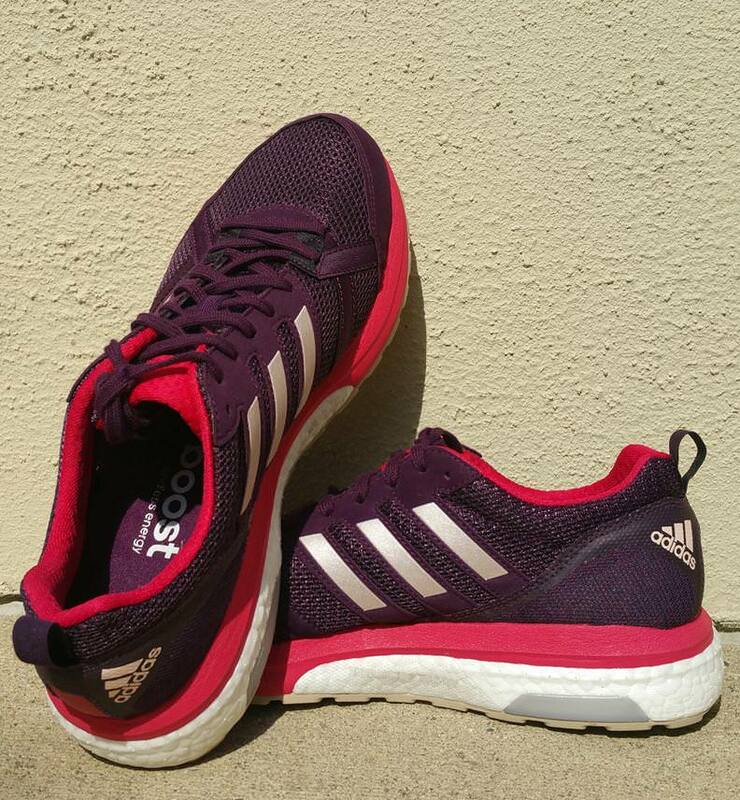 I have been running long distances and marathon in Asics GT-2000 6 and I wanted to try a lighr shoes so I bought Adizero tempo 9 and it really boosted my training and speed. I crashed my half-marathon in it but it hurt my knees so no I switched back to GT-2000 6 to see how it works out. Does anybody else felt similar? Be aware that you will need half size bigger compare to Asics GT-2000 6 as it has very small room at the front. Usually wearing orthopedic insoles, I try to run with stabilized shoes right now. I have a pain in a ligament under the arch, and the orthopedic sole is exactly in that position. I usually run Adidas, the Adios Boost. I discovered Asics and its stability with the GT-2000 6 that I like a lot. I would like a pair of lighter shoes for short or fast running sessions, equivalent to Adios. I hesitate a lot between the Asics DS Trainer 23 to stay in the continuity of the brand, or the Adidas Tempo 9. I had the Adidas Boston that I did not like, I found that they had less lateral support as the Adios, the mesh was too soft. In your opinion ? I’ve run in GT-2000 6 and Tempo 9 that you mention, but not the other adidas shoes. I think you’ll do well with the Tempo 9 for a light, supportive shoe. The upper isn’t very supportive (why I gave it 4.5 stars), but I really like the sole unit. Overall it’s my favorite marathon shoe yet. Thanks for your reply. I have read this too late, i have yet buyed the Asics DS Trainer 23. These one are too stiff for me. Got some pain on my calf after a long run with. The Asics DS are very cushion and lightweight, but i don’t know how to consider these. I haven’t the rebound or the dynamism i expected. I just ordered the Adidas Tempo 9 to compare. But i think these ones will be as fit and flexible as the Adios. To be continued. Now that you’ve had some time in Adizero, what do you think? …just checking in! I did’nt run more miles with, because i always have my calf injury. Then i will write you a feedback about! One of the most unique shoes I’ve used as an over-pronator. Very soft and flexible feeling compared to other rigid iconic stability shoes (kayano, paradox) yet a lot of support and confidence. Not raced them yet but I’m gonna do it in a half-marathon this month and I’ve already ordered a second pair. Love this flexible feeling and the lightness. The best adidas I’ve ever used! I ran my Vengefuls to the ground, and I’m hoping to find a comparable shoe in a couple days. I admire the Tempo, but will the shoe feel less cushioned than my Vengefuls? The upper is more or less similar, right? Thanks! Tempo’s upper fits slightly smaller, I’d say, esp in the toe box. Just looking over this review, I wonder if Solarboost might be what you’d enjoy. Thanks Kristin, everyone for the tips. I tried on the Tempos, and felt them to be a degree firmer and deader underfoot than the Vengeful, but more responsive in the heel. The upper felt very comfortable, and the design was on point! I expect I would notice some tongue slide. Instead I went with the Saucony Freedom ISO, and I’ve been satisfied (despite the drop height, but read on). The upper fits like the vengefuls, but a bit plusher. I found the midsole to offer similar cuishoning to the Vengefuls despite feeling firmer, possibly due to a single firmer TPU unit. They ran more responsively and versatiley than the Vengeful. The drop height on the Freedom is a 4mm to the Vengefuls 10+mm, and it caused me severe calf issues during my first weeks using it. Research it–I’d recommend starting slowly when changing drop heights, running just minutes a day, because I had bad calf knots for days after my first ten mile run. The shoe in general fits a full size and a half smaller than the Vengeful, so be aware! I think it has a very similar feel to the Vengefuls, but drastically improved. Despite the drop height, if you are considering the Vengefuls or similar, I would look closely at the Saucony Freedom ISOs! $60 on Amazon. Saving them for track work but didn’t work for me for road races. Broke them in with a number of tempo runs and once at the track with no problems but did not have good race experiences in them. I’d be interested to hear where the other reviewers were from as I’m in the south after 30+ years near Boston and heat/humidity is a thing here. In both races these shoes took on water (sweat to be more exact) to the point that they were heavy and squishy after. I was actually drying them out in the sun before the awards started. These were hot humid 5ks and if 10k+ I’m sure blisters would’ve been an issue. Is this actually suitable for overpronation / weak ankles or is it just a slightly stabilized neutral shoe? Joey, this is just a slightly stabilized shoe, geared more for lightweight performance than structural support. I’m considering buying some Tempo 9s, can anyone tell me how they fit compared to the Ulraboost ST or Boston 6 lengthwise? The UB are my daily shoes at present. Tried on the Boston 6 in a local store last week and found them to come up a good half size smaller than the UB. They don’t stock the Tempos so trying to judge which they match closer for sizing. I am a very happy Tempo 9 guy. I did try on the Boston in a running store and my memory is that they fit pretty much the same as the Tempo 9. I have not tried on either shoe you mention, but I’m guessing Tempo 9 fits more like Boston since it fits about a half size smaller than all other adidas shoes I’ve run in (Supernova Sequence 9, Vengeful, Supernova, Supernova ST, Aerobounce ST). Carl, I use both the Tempo and Boston in the same size and haven’t noticed any difference in length. Can tempo 9 be used for hard soil,(no debris,rocks) Trail for distances 4-5 miles medium paced runs ? Sam, I certainly think so!